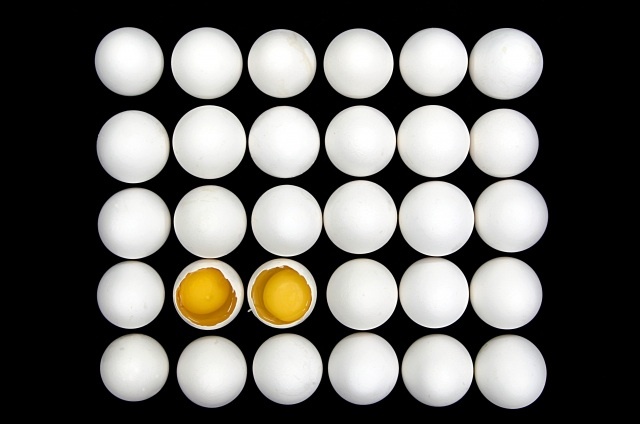 A Ton of Bad Eggs….. The egg recall of a half billion eggs (that is a lot of eggs to collect) that is just winding down will hopefully be a wake-up call to the realities of industrialized, factory produced food and the dangers of large, concentrated food producers who supply the entire country…not to mention companies that have repeatedly violated food safety standards yet are still in business. Over the last year there have been so many food scares involving food recalls it is becoming common place. Does this remind you of some science fiction movie? It does me. The good news is that over the weekend sales of eggs at farmers markets were a farmers dream come true. This MSNBC article talks about farmers markets from coast to coast that had record days with their eggs. Many egg sellers sold out before noon and had new customers, as well as many buying more than just one dozen. This NY Times article from yesterday points out how this salmonella outbreak brings to light the flaws in our commercial, industrialized food system and the governments food safety system. We can see how the system broke down and much of that was due to lax regulations and a strange division of responsibilities between the Dept. of Agriculture and the FDA. It is a system that has not been modified to protect the public given today’s industrialized food model. Hopefully many will realize that even with better regulation, which surely is needed, the system as it functions just doesn’t make sense. Industrialized factory food creates more pollution than smaller scale production of chickens, cows and even produce. When animals are allowed to exist as they do in nature with room to roam, cow or chicken, what creates a toxic pond at a factory farm can now fertilize the land and improve it. With smaller production more jobs are created and more humane ones. The film and book Fast Food Nation is a journey into the world of industrial farms and our food system. Smaller but more numerous farms and ranches also means shorter drives to market. Just two factories distributed all of these tainted eggs from coast to coast. Imagine how much fuel it takes to transport a half billion eggs. When you buy local you are helping to conserve oil and reduce the pollution from all of those “food miles”. Another problem with this system is that so much of our crops need to go to feeding livestock. Over 75% of all corn grown in America is used to feed livestock not people. On the open range cows graze, and supplementing their diet with hay is much better for the land and especially for the animals. Cows were not even meant to eat corn, it actually makes them sick, so then they need to be given antibiotics…it goes on and on and a cycle is created from this crazy food system that takes a bad situation, so many animals crammed into awful conditions and makes it worse. And imagine the life that chickens have living in confined cages where they cannot even sit compared to animals that are outside and leading relatively normal lives. The question of even eating meat is one that many people grapple with, but whether you chose a vegetarian lifestyle or not the bottom line is our system of factory farms is really awful for everyone involved, except the top management and stockholders of these companies. So if you do eat meat support local, sustainable, humane producers-they are out there and they need our support to survive. The current laws and regulations have been created amidst an environment of lobbyists who have had the government’s ear, and politician’s pockets, more than we the people, but this scare could be an important part of changing this. We need to speak out louder and let our elected officials know that we demand something different. It is important to show that we mean this by shopping at farmers markets, local coops, buying pesticide and antibiotic free, non-GMO food and humanely raised, grazing animals. Here is a link to Local Harvest, an organization that lists farmers markets across the country in case you don’t know where one is nearby. It is up to us to act. So let this most recent salmonella outbreak be the straw that breaks the camels back and start shopping local if you don’t already. Not only will you protect yourself and your loved ones from future outbreaks, you will make a big step in protecting the environment and your health and you will be eating much better quality food. I agree, let’s hope this latest Sick Food scandal gets more people to farmer’s markets and boosts local food production. Bill McKibben, in his new book Eaarth, cites numerous sources to show that small-scale farming is not only healthier and less onerous in terms of pollution, but also is more productive, acre for acre. This is especially true because small farms can intersperse different crops to enhance soil health, whereas industrialized operations are locked in to monocultures which deplete the soil and require massive amounts of fertilizing ‘inputs’, themselves a major cause of pollution, and coastal die-offs.